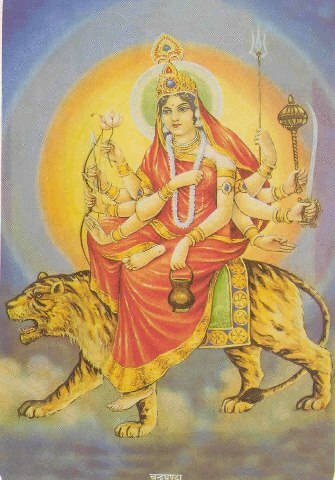 In this form Durga is 10-armed and rides a tiger. This is a terrible aspect and is roaring in anger. This form of Durga is completely different from earlier forms and shows when provoked she can be the terrible or malevolent. Chandraghanta is worshipped on the third day of Navarathri. By her grace all the sins, distresses, physical sufferings, mental tribulations and ghostly hurdles of the devotees are eradicated. Riding on the lion the Mother inspires her devotees with fearlessness. She is the very embodiment of serenity. The devotees who adore and worship her with their deeds, minds and speech develop an aura of divine splendor. a great impact on those who come in contact with them. They easily achieve success in every walk of life. Maa Chandraghantaa is ever ready to destroy the wicked, but to her devotees she is ever visible as the kind and compassionate Mother showering peace and prosperity. The complexion possessed by Maa Chandraghantaa is golden. She possesses ten arms which wield weapons and missiles like the sword, the bow, the mace, the arrows and the like. During the battle between the gods and the demons, the horrible sound produced by her ghantaa had sent thousands of wicked demons to the abode of the Death-god. She is ever in a warring posture which shows her eagerness to destroy the foes of her devotees so that her devotees may ever live in peace and prosperity. Divine vision is acquired by her grace. If a devotee happens to enjoy divine fragrance and hears diverse sounds, he is said to be blessed by the Mother.